The 7-show run – with guests The Raven Age – will open in Christchurch, NZ on April 29 and hit Auckland on May 1 before playing 5 dates in Australia. Fanclub presales start on September 17, with tickets going onsale to the general public at noon on September 24. 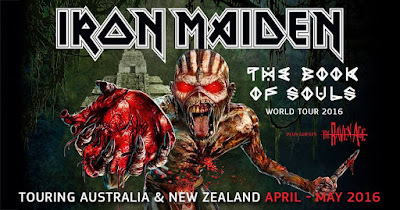 "We cannot wait to get back out on tour,” says singer Bruce Dickinson. “When we start in the USA in late February it will be 19 months since our last show at Sonisphere in the UK so we are raring to go. Maiden thrive on touring and getting out to our fans, it's what we do best, so it will be a great feeling to board our new Jumbo Ed Force One with the crew and the gear and head round the globe and get back on stage for you guys. More dates will be announced soon as the band prepares to launch the trek in the US in February. The group’s 16th album, “The Book Of Souls” was recorded in Paris in 2014 and produced by Kevin Shirley.